You ask for directions from a friend. They respond by drawing you map. The map you are given is hurriedly scribbled on the back of a napkin. At the time you graciously thank them for the effort. But, when you have to actually use the map you realize the jumble of crossing lines lacks proportions and is far from clear. The map makes you wonder about your friend’s ability to think logically. The act of creating a good map is both a science and an art. Good maps can provide directions, details about landscapes and say a great deal about the world around us. Good maps illuminate the important details while minimizing distractions and extraneous information. Poorly designed maps are often frustrating, confusing, and at times misleading. The science behind maps can easily been seen in modern surveying techniques and commonly used cartographic standards. What about the artistry of map making? 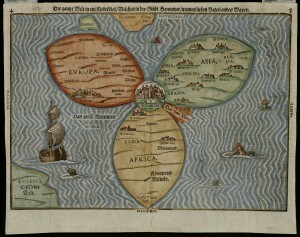 The earliest maps fall more into the category of works of art than works of science. When cartographers had neither the geographical or cartographic knowledge to make accurate maps artistic license was used to express worldviews in map form. Maps during the middle ages and renaissance eras were often aesthetically pleasing and closely related to painting. Many of these early maps were in fact landscape paintings drawn with new perspectives. 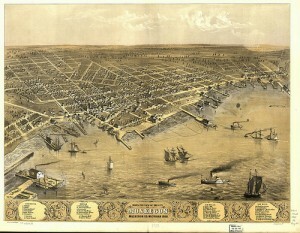 Bird’s Eye View of Muskegon 1868. Public Domain, Library of Congress. For example, famous cityscapes, drawn from a birds eye view, were often artists representations of what a city might look like from above. In these cityscapes important buildings were made more prominent, trees and features which might block lines of sight were left out and less prosperous areas were painted with a broad brush or minimized. These cityscapes were often conceptualized from the ground or a highpoint in the town, with the artist focusing on making the view of the city visually appealing and not necessarily completely representative. Maps reflect prevailing notions of space and sense of environment. Early maps featured no uniform style of measurement and little scientific sense of space. Eventually maps began to gain clarity as techniques of navigation, measurement, and travel improved. Though even with the improved sense of geography, measurement and satellite imagery, art still plays a significant role in map making today. What do you remember most from high school geography class? If your experience was anything similar to mine, you remember spending a considerable amount of time using pencil crayons to colour maps. This emphasis on colouring reflects the fact that cartographers still use a number of pictorial techniques in map creation. Relief is shown by highlights and shadows, line hatchings and shading are used to show gradients in the land. Colours and symbols are used to illuminate physical and social geography in a two-dimensional mapping space. Blue always means water. Red once represented the British empire and a myriad of topographical features can be illuminated through the use of a legend. How does the infusion of art into map making transfer into a world where Google maps and GIS dominate the world of maps? Digital mapping is not limited to the visual, flat, or static forms of paper mapping. Digital maps have created the possibility of infinite layers of information and have expanded the type of information which can be contained in maps. The layers of Google Earth provide an example of the possibilities in digital mapping. Users can view satellite imagery, topographic details, street views, road maps, and historic perspectives all in one place. It is now possible to compare modern day landscapes with landscapes from hundreds of years ago on one map. Road maps can now provide links to businesses and provide a photography based view of streets. Prior to digital technology this abundance of information could never have been contained all in one map. Technology and science have transformed mapping in the creation of accessible digital cartography. But, even digital maps still place a heavy emphasis on visual appeal. Many Google Earth features respond to the desire for mapping to be visually informative and visually interesting. Visually focused digital maps, art infused with digital map content, and geolocation based art projects all highlight the continued connection of maps and art, even in a digital world. The existence of accurate maps and the work that goes into map creation is something which is often taken for granted. Digital maps and GPS have become so commonplace that we often forget the long history and new technology that surrounds mapping. Maps can provide insights into geographic details, historical conceptions of space, social tendencies and so much more. Krista McCracken is a Researcher/Curator at Algoma University’s Shingwauk Residential Schools Centre, she is a co-editor of Active History. I remember doing cultural mapping exercises – both in my volunteer and academic life – to show how perceptions of place are effected by so many different factors. Krista, your piece left me asking two questions: 1) Are digital maps that much more “accurate” — how do we define accuracy in mapping? Whom is the map to be accurate for? and 2) What will be the future of mapping? Google Maps allows the crowdsourcing of sites located on a map and after Hurricane Irene, there was a crowdsource map of damage in NYC (http://mashable.com/2011/08/29/nyc-crowdsources-tropical-storm-irene-damage-map/). In addition to the physical map providing insight into conceptions of space, so to does the process of creating a map, as, I think, it always has. Thank you for your comment and questions. I don’t definitive answers your questions, but I have some thoughts on them. 1) I think accuracy in mapping depends a lot on the use and end users of the map. Users experience maps differently and what might be useful to one person can be meaninglessly to another. I don’t think digital maps are automatically more accurate than hand made maps, but technology has definitely changed our conceptions of space, measurement, and quantification. 2) I’m not sure what the future of mapping might be. But, I think there are a multitude of opportunities for projects such as the crowdsourced map you mentioned for collaboration and re-purposing of maps. I think you hit the nail on the head with your assessment of the process map making reflecting conceptions of space, just as much as the physical map. Thanks again for your comment.